Communication cables and components: Optic Fiber system for LANs, MANs and WANs, including both metal-armored and all-dielectric optical fiber cables. They provide electrical data transmission to certain components. Signalling cables: Copper, multi-pair signalling and control cables are hybrid energy/telecom cables providing low-voltage energy and two-way telecommunications. They provide signal transmission for control purpose. 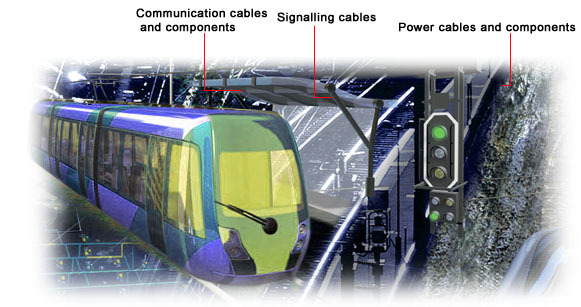 Power cables and components: Cables ranged from low voltage to high voltage for railways and trams.